Every unit at the BreakWater Condominiums includes a large 12-foot by 18-foot private deck that is large enough to accommodate grilling, outdoor dining, entertainment, lounging in the sun, and growing a few plants. 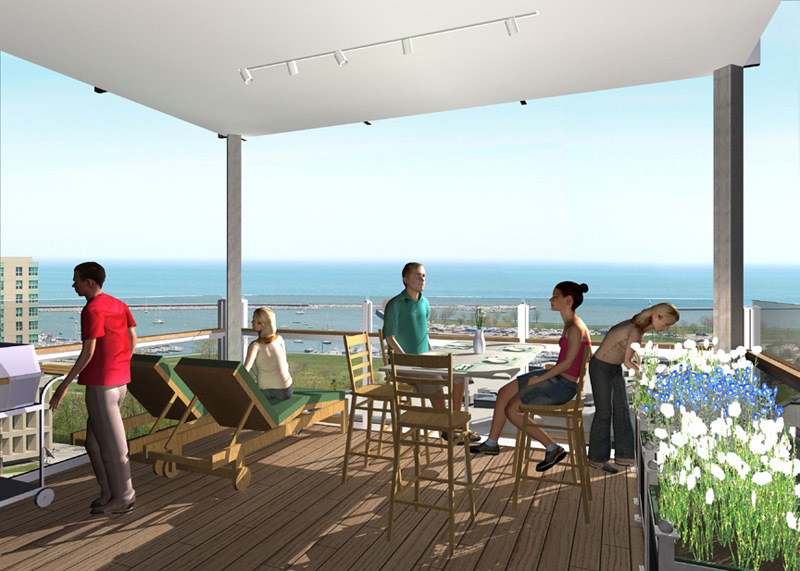 Every deck at the BreakWater Condominiums includes steel and glass rails that cut down the wind and extend the season. The deck rails are configured to allow an additional glass panel to be slid in from the top to provide further protection from the lake winds. The decks have enough room for comfortable dining, a gas connection for outdoor grilling, a hose bibb for watering the plants, and track lighting mounted on the deck above for night lighting. Each deck has a drainage system so if you water the plants you don’t water the deck below, and almost all the decks have a deck above so you can enjoy outdoor life even if it is raining.